Reading The Times of Botchan reminded me of watching Alexander Sakurov’s cryptic 2002 film Russian Ark. Both employ a similar gambit: a literary figure from the country’s past wanders through a landscape populated by real people who played pivotal roles in its modernization. In Russian Ark, the author/protagonist role is filled by the Marquis de Custine, a French aristocrat who published Empire of the Czar: Journey Through Eternal Russia in 1839, while in The Times of Botchan the role is fulfilled by Soseki Natsume (1867-1916), the defining novelist of the Meiji Restoration. Neither Ark nor Botchan employs a clear, linear narrative; both works are episodic — even, at times, picaresque — in nature as their principle characters rub shoulders with poets, composers, czars, and politicians. When we first meet Natsume, he is writing a novel called Botchan, a short, satirical work about a energetic young man who suffers from a Holden Caufield-esque desire to expose phoniness wherever he goes. Nastume hopes Botchan will help him achieve catharsis from a vague but nagging sense of anxiety brought on by the period’s social, political, and economic upheavals, from the Freedom and People’s Rights Movement to the first murmurs of suffragism.1 Though we occasionally see Natsume in his study drafting chapters, or admiring the inky paw prints left behind by his cat, much of the manga is devoted to Natsume’s travels through Tokyo, which brings him into contact with historical figures from An Jung-Geun, an activist who assassinated the Korean governor in 1909, to Hiruko Haratsuka, a feminist active in the Seito suffrage movement of the 1910s, to Lafcadio Hearn, a Western journalist whose fascination with old Japan inspired him to write Kwaidan: Stories and Studies of Strange Things. Some of these encounters are the jumping off point for vignettes about Westerners living in Japan, or the state of Japanese literature, while others are mere coincidence and treated in just one or two panels. The resulting manga feels like a tableau, or the Japanese equivalent of a guided tour through Colonial Williamsburg, as our unseen narrator identifies the sprawling cast of characters and mentions key events in Meiji-era history. Despite its historical ambitions, The Times of Botchan is best read for its quieter moments. Jiro Taniguchi creates intimate scenes that require little or no dialogue to convey their nuance: two acquaintances walking silently through a snowing streetscape, Natsume working in his study. Small details capture the transitional nature of the period, and speak volumes about the characters’ ambivalent relationship with the West, with some embracing European dress, others flatly rejecting it, and most, like Natsume, striking a compromise, combining a yukata with a button-down shirt and bowler hat. At that moment, Ogai felt, for the first time, that he was back in Japan. In this country, individualism was not regarded as a personal virtue, the ‘family’ had to be considered. Ogai was unable to speak the words he had prepared and became mute as a fish. Such heavy-handed interjections suggest that Sekikawa doesn’t trust us to decode moments of mystery, poetry, or ambiguity on our own; at least the Marquis de Custine never bothered to explain why Nicholas II and victims of the Kursk disaster haunted the same wing of the Hermitage. The Times of Botchan‘s other great flaw is its deadly serious tone. The two novels that Natsume wrote during the period portrayed in the manga, I Am a Cat and Botchan, are both satirical, filled with wry observations about human nature and sharp critiques of pomposity, greed, toadyism, and empty-minded embrace of Western mores.3 Though the manga is filled with visual signifiers for both works — cats, in particular, are a recurring motif throughout the first two volumes — the manga lacks the delicate touch of either novel; one might reasonably conclude from Sekikawa’s narration that Botchan was a Zola-esque expose on the evils of Westernization, rather than a comedy about a young teacher coping with the inept faculty at a podunk boys’ boarding school. On the left diagonal of the hands that hold the horse’s reins. A new air rises in the world. A lively debate follows, with some detecting a whiff of socialism in the cowherd’s profession, and others praising it for its direct simplicity; not until the group’s acknowledged expert interprets both poems does the group reach consensus on their quality. The punchline comes in the final panel, when one member acknowledges that the first poem made no sense. In that brief scene, Sekikawa and Taniguchi capture the spirit of Botchan without slavishly recreating a scene from it; one could almost imagine the savage nicknames that a younger, less pretentious member of the circle might lavish on his elders as they debated the merits of both poems. In another rare moment of levity, Natsume witnesses a young suffragette making out with her paramour in a restaurant, noting the length — three and a half minutes — and intensity of their kiss. Taniguichi draws that kiss in almost pornographic detail, with panel after panel of the two lovers’ mouths drenched in saliva, in essence showing us how Natsume views their contact, with a mixture of prurient fascination and revulsion. Sesikawa and Taniguchi then takes things a step further, borrowing a page from Milos Foreman’s Amadeus to suggest how this brief, everyday experience found its way into the pages of Botchan, with the suffragette morphing neatly into the Madonna, a social-climbing temptress who switches romantic allegiances when it suits her interest. Given the didactic tone and frequent allusions to unfamiliar historical figures, I’m hesitant to give The Times of Botchan an unequivocal endorsement. Some readers will find the book long-winded, confusing, and perhaps even a little boring. 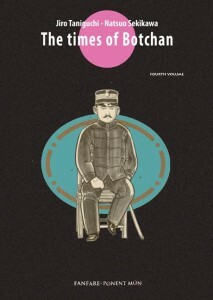 But for those already enamored of Taniguchi’s superb draftsmanship or well-versed in Japanese culture, The Times of Botchan offers readers a lovely reward: a window into one of the most fascinating periods in Japanese history, and the creative process of one its most important voices. 1. The Freedom and People’s Rights Movement in Japan began in the 1870s. Building on the reforms established in the Charter Oath of 1868 (which abolished Japan’s rigid class structure, among other provisions), urban intellectuals lobbied for the drafting of a constitution and the creation of a parliament. 2. Ogai Mori is best known to Western audiences for his novels The Wild Geese and Sansho the Bailiff, the latter being the basis of Kenji Mizoguchi’s 1954 film. 3. As translator Joel Cohn notes, Botchan (the novel) occupies a similar place in the Japanese canon as Catcher in the Rye and Huckleberry Finn, and is a standard text in most high schools. See the introduction to Natsume Soseki, Botchan, Translated by J. Cohn (New York: Kodandsha International, 2005). Review copy of volume four provided by the publisher. This is an expanded version of a review that appeared at PopCultureShock on 6/5/2007. The original review focused on volumes 1-3 of the series. I’ve been curious about The Times of Botchan, since I tend to like Jiro Taniguchi’s stuff, so thanks for reviewing it! I own, but have not read, Botchan and I am a Cat. I wonder if you think reading those beforehand would be helpful at all. I would strongly recommend reading Botchan before tackling the manga — there are a number of scenes in which Sekikawa suggests the inspiration for passages in Botchan that won’t make much sense otherwise. I read the first three volumes ages ago, before I’d read either novel, and found myself scratching my head a lot. Reading the novels helped me navigate the series a lot better, and helped me make sense of the characters.